Get inspired by Hulk and embrace the colour green? Confused? 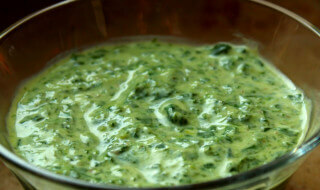 We are talking about palak raita! Blend in this mineral rich green into curd for a powerful combo and an accompaniment to all the rice/subji delicacies. Cook the palak leaves after cleaning for 5 minutes in water. After they become tender make a smooth paste and add curd as well as salt to taste.